Anaheim, Calif. and Lake Buena VistA, Fla. (Dec. 14, 2016) – Following a festive kick-off to the holidays that began Thanksgiving Day with two new broadcast specials, Disney Parks will close out 2016 with its most cherished seasonal tradition of all – the annual Christmas Day spectacular. “The Disney Parks’ Magical Christmas Celebration” airs Sunday, December 25, 2016, on the ABC Television Network (10a.m. – 12 p.m. ET; airtimes vary; check local listings) and on the ABC and the Disney Channel apps. 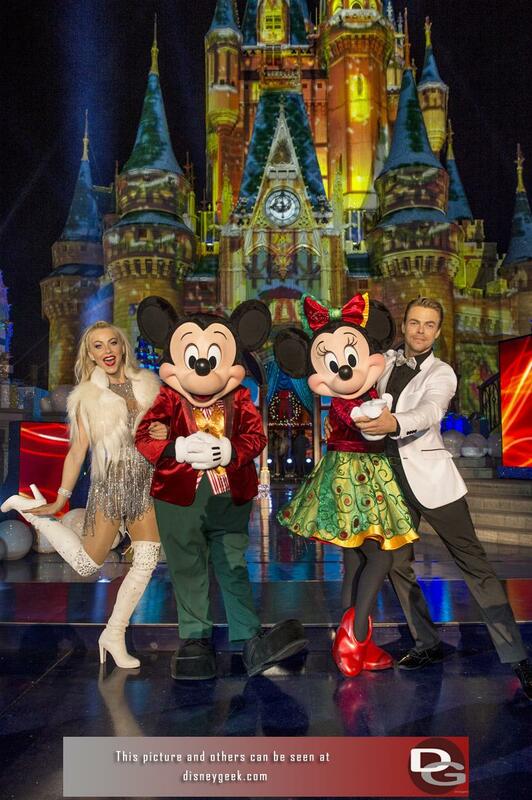 Ushering in its 33rd year are the dynamic brother-sister duo from “Dancing with the Stars,” Julianne Hough and Derek Hough, who will present the two-hour ABC special from the Walt Disney World Resort. The season’s most eagerly awaited celebration culminates with the fan-favorite Christmas parade delivered by Disneyland correspondent, Good Morning America’s Jesse Palmer from the action-packed parade lines alongside other exciting celebrity guests. All four parks of the Walt Disney World Resort get in the holiday spirit with new shows, thrilling spectaculars and beloved characters to create lasting memories. At Magic Kingdom Park, in addition to exciting new entertainment for the special-ticket “Mickey’s Very Merry Christmas Party,” Cinderella Castle transforms into a shimmering ice palace as Queen Elsa leads “A Frozen Holiday Wish” nightly. At Disney’s Hollywood Studios, an all-new “Jingle Bell, Jingle BAM!” sends beloved Disney characters on a mission to get Santa back to the North Pole in time for Christmas Eve. At Epcot, in addition to global entertainment, guests can explore what the holidays taste like around the world. For its first-ever full holiday celebration, Disney Springs is wrapped in festive décor and entertainment, while dozens of new stores have laid the welcome mat out for holiday shoppers. An all-new nightly spectacle, “Starbright Holidays,” fills the skies above Disney Springs with 300 show drones performing an amazing aerial ballet set to holiday music. At Disney California Adventure Park in the Disneyland Resort, a new “Festival of Holidays” treats guests to music, dance, food and heartwarming holiday traditions. The popular World of Color nighttime water spectacular is also transformed into “World of Color – Season of Light” with holiday music and treasured Disney animation. Among a sleigh-full of holiday events and activities at Disneyland Park is “A Christmas Fantasy,” a daily parade of floats, music, tin soldiers and holiday cheer. In addition, Sleeping Beauty’s Winter Castle creates magical snowfall moments along Main Street, U.S.A. The 33rd annual Christmas celebration airs nationwide on December 25 at 10 a.m. EST and 9 a.m. CST, MST and PST on the ABC Television Network. The show will also be available on the ABC and the Disney Channel apps. To stay updated on the Christmas Day telecast on social media, follow along with the #DisneyChristmasCelebration hashtag.